Grass Not Cutting it? Then Why Not Use Stone! 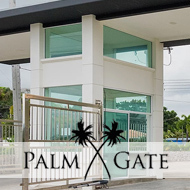 Thai Garden Design were approached by an Australian client in Hua Hin who has had lots of problems keeping grass in the shady entrance part of his garden. Eventually he’d become so frustrated he took up all the grass, levelled the ground, and then was a little confused about how to finish it. The team created a bespoke pebble garden of approximately 30 SQM, utilizing a variety of different coloured-and-sized stones so as to maximize the areas look and appeal. A black plastic layer was used as an underlay, to prevent ugly nut weeds from penetrating the nice new rock garden. The black plastic was cut around existing and new planted areas, which would then act as ‘islands’ of vegetation and inject additional vibrant colours to the garden. The water feature was chosen for its size and its look of smoothed grey concrete, which nicely matches the pavers and gives a nice contrast against the rest of the colour of the garden. The pavers cut a meandering path through the garden, making it a nice colourful walk for visitors (and easy access for workers, who no longer need to walk across the terrace across the front door). The resulting rock garden is a myriad of colour and shape that works together to create a harmonious environment which is also extremely practical in terms of maintenance and drainage. In the market for improving your garden landscape in Thailand? Email [email protected] for assistance. Next Next post: Need More Parking Space? How About Sandwashed Concrete?